The 5th century is the period from 401 - 500 in accordance with the Julian calendar in the Christian Era. The events for which the 5th century is best known for is the Fall of Rome to Germanic tribes, ending the 600-year rule of the Romans in Western Europe. The Roman Empire continued as the Byzantine Empire in the Eastern Mediterranean until 1453. Other notable events include the founding of Chichen Itza and the writing of The City of God by St. Augustine. 476, August 28: Deposition of Romulus Augustulus by Odoacer: traditional date for the Fall of Rome. 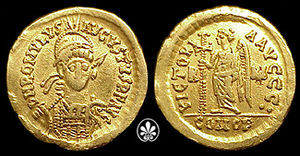 480: Death of Julius Nepos in Dalmatia, the last de jure Western Roman Emperor. Buddhism reaches Myanmar and Indonesia. According to the Book of Mormon, Moroni buries the Golden Plates and ends the record around 421. Niall Noigiallach, founder of one of Ireland's greatest dynasties.